When Jesus Christ was teaching his disciples about their connection and His love for the disciples, He made it clear what the greater love is. 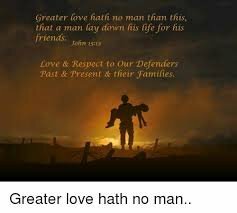 John 15:13 (KJV): "Greater love hath no man than this, that a man lay down his life for his friends." He made us to know the real meaning and concept of true love. The scripture above is probably one of the first scripture majority of Christians first memorised. As long as I can remember, I learnt about it when I was in Nursery school. The word, “bestowed” also means “lavished”; the Father has lavished His love on you. It’s love without limits. Think about it: we who shouldn’t have been known of God, who shouldn’t have ever come close to God are now, as a result of the superabundant love He’s lavished upon us, accepted of Him. We’re now called the sons of God. What an amazing reality! What is love? It’s that endearing value of a person that gives you a sense of his or her importance to you as the object of your favour. Therefore, that God loves you means you’re special and valuable to Him. This understanding will change your life and give you an extraordinary mentality. Consider a man like David, who had a unique perception of the love of God; his understanding of the Father’s love made him think differently. In Psalm 23:1 for example, he said, “The LORD is my shepherd; I shall not want.” This alone lets you know what David thought about God, for which reason he was such a success, and his life, so victorious! He knew he was valuable to God, and the object of His favour. Always take out time to meditate on the love of God. Think about His grace, kindness and the fact that if you were the only one on earth, the Lord Jesus would still have given His life for you. That’s how valuable you are to God. Dare to believe this and let it sink deep into your consciousness; it’ll change your life forever and give you a new confidence. Dear Father, I thank you for your love, and your grace upon my life. Thank you for making me the object of your grace, glory, and righteousness; my life is the expression of your praise, now and forever, in Jesus’ Name. Amen.